Travelers have been looking at basic economy airfares the wrong way. It’s gone way beyond airlines matching the cheapest prices of discount competitors. It’s really about keeping their biggest spenders spending, a new variation on the old Saturday-night stay requirement. Delta , United and American have found a new way to shoo business travelers away from their lowest prices and make them pay more. That’s exactly what the much-hated Saturday-night stay requirement, now seldom-used in the U.S., did in its heyday of the 1980s and 1990s. The rise of cheap basic economy fares loaded with restrictions is the latest move in the chess match between airlines and corporate travelers. The big three airlines, faced with several years of falling average domestic ticket prices for business fliers who have wised up to old airline tricks, are expanding basic economy fares to all their domestic routes. These aren’t just the ones where they compete against discount carriers like Spirit, Frontier and Allegiant. American and Delta also are launching it on flights to Europe ahead of summer. United says it will start rolling it out internationally with Latin America by the end of June. Delta and American are using it to Mexico, and American to the Caribbean, too. Their partners on those routes are starting to use basic economy fares as well—watch it spread world-wide. Basic economy tickets lack advance seat assignments, typically board in the last group, often prohibit carry-on bags in overhead bins and aren’t eligible for upgrades or any kind of changes. Delta offers one free checked bag on flights to Europe except on basic economy, which starts April 10 on trans-Atlantic routes. A typical Atlanta-Paris trip is about $50 less each way on a basic economy ticket, but if you check a bag, you’ll pay a $60 fee each way. Beware other gotchas. Because of all those added restrictions and looming frustrations, most corporations have blocked them from their displays, according to travel management companies. American Express Global Business Travel says about 75% of its clients have suppressed basic economy fares from booking sites. Topaz International, which audits airfares for big companies, says 103 of 104 clients have blocked basic economy. Egencia, the business travel unit of Expedia , says all of its clients have rejected basic economy. Whatever savings come from paying $50 to $100 less each way could be obliterated by a business traveler missing one flight and having to buy a new ticket that costs more than $1,000 instead of going standby on another flight, notes Gabriel Rizzi, president of the corporate travel division of Travel Leaders Group, one of the largest U.S. travel agencies. “It doesn’t have a place with any of my customers,” he says. The corporate blockade is what airlines had hoped for, according to several airline pricing executives. Segregating business travelers and vacationers who aren’t price-sensitive from the lowest prices means airlines can move them both to more expensive fares. Meanwhile, airlines get to show up in booking displays with cheap prices that lure leisure travelers. But when those fliers read the fine print, many of them pay more. More than 50% of customers presented with a basic economy fare trade up, airlines say. “Basic economy is just another product that airlines are using to further segment the marketplace,” says Jeremy Quek, air practice line lead at American Express GBT, and a former British Airways pricing executive. Airlines say they have no problem with corporate travel agencies blocking basic economy offerings and acknowledge the comparison to previous fare fences like Saturday-night stays. 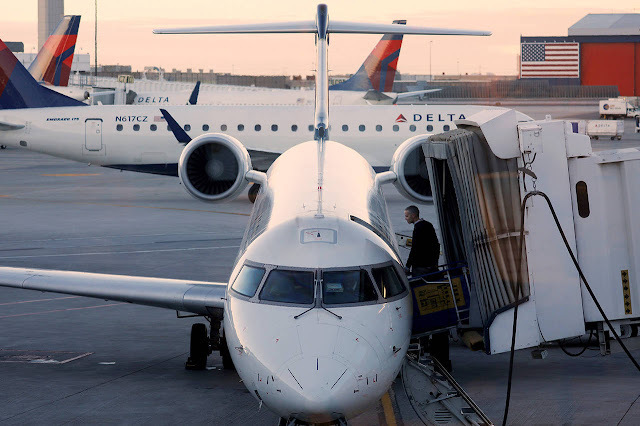 Delta and American both said corporate customers can choose the options that work for them. United never envisioned basic economy as a tool to combat discount airlines, but as a “segmentation tool” to split customers willing to pay more to get more from price-sensitive travelers, says Dave Bartels, United’s vice president for pricing and revenue management. “I wouldn’t necessarily equate the two [basic economy and Saturday-night stays], but directionally that’s probably true,” he says. Since the dawn of deregulation in 1978, airlines have been trying to find ways to biopsy the wallets of travelers and offer the same seat on a plane at one fare to price-sensitive consumers and a higher fare to travelers with deeper pockets. At big airlines, executives say, roughly 15% of customers generate 45% of revenue. Advance-purchase requirements are one basic way: Instead of selling all seats at a low price long before departure, the airline takes an economic risk by holding back seats for business travelers, so it prices those seats higher. The price difference can be enormous: $2,000 for an unrestricted coach ticket but $200 for a discounted itinerary sold well in advance. More recently, frequent-flier programs switched to giving out miles based on fare instead of distance, richly rewarding people who buy expensive tickets and enticing business travelers to book closer to departure on higher-priced tickets. Frequent fliers on upgrade lists are often prioritized not just by elite-level status but now by ticket price, too. But many of the old tricks no longer work, travel managers say. The widespread growth of airlines like Southwest that don’t require a Saturday-night stay, plus changing travel patterns where many business travelers don’t mind a Saturday-night stay, effectively killed that option. Business travelers are more willing to book trips in advance, Egencia data show. Many business fliers naturally take pride in finding cheap tickets, just as they do in their personal travels. Companies closely monitor employee travel spending and have recently been tightening travel policies to reduce costs, says Barbara Barnard, senior vice president at Carlson Wagonlit Travel. Some offer rewards to employees willing to do company business on cheap tickets. Topaz says the average domestic business-travel fare in the U.S. for the companies it audited was $572 in 2014 and last year was down 20%, to $455. Egencia says its average ticket price was down 13% over the same period. Year-to-date through March 26, tickets are running another 3% cheaper than last year. Corporate travel departments say they face a risk by blocking basic economy fares. Travelers routinely comparison shop to see if their corporate travel department really is getting them the best deal. When they see a lower price elsewhere for the same flight, it reinforces worries that their travel agency isn’t plugged into the best prices. For that reason, Amex GBT encourages clients to show the fares but inhibit actual booking with an explanation of why basic economy prices aren’t appropriate, Mr. Quek says.